The memory modules below are 100% compatible with your Acer Aspire ZC-606-UR25 Desktop. Not your model? 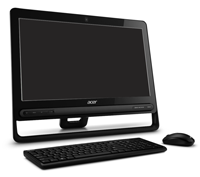 View the complete range of Acer Desktops or view all Acer upgrades here. Windows Server 2016 included a feature called ‘Storage Spaces Direct’ that enabled the building of highly available (HA) systems of storage using local storage resources and which in turn extended the SDS (software defined storage) in Windows servers. Also referred to as S2D, the system was developed by Microsoft to help make the management and deployment of SDS systems more simple, in addition to opening up the use of new disk technology like NVMe (Non-Volatile Memory Express) and SATA (Serial Attached Technology Attachment). BenQ is a well known producer of computing hardware, electronics and communications equipment, which is supplied to various international markets around the world. The company name is an acronym of ‘Bringing Enjoyment ‘N’ Quality to life’ and its primary product lines include computer components, digital camera, LCD monitors and digital projectors. The headquarters of the business is situated in Taipei, Northern Taiwan, with a number of satellite offices in China, South America, the US, Europe and the Asia-Pacific. In all, BenQ is represented in more than 100 countries around the globe. BenQ itself began life as part of parent company, Acer, but branched off in 2001. Acer retained a partial interest in the company up until 2006 when it sold the rest of its stock to BenQ. In its early years, production centred around its range of ‘clamshell’ mobile phones and Windows mobiles. There was a total of 15 phones created during a 2 year period under the sole brand name BenQ. During the Autumn of 2005, BenQ Corporation purchased the mobile division of German company, Siemens A.G. This instantly made BenQ-Siemens the 6th biggest producer of mobile phone hardware by market share and formed a company whose primary field was wireless communications. Just 2 years later, the move had proved an unsuccessful one and led to BenQ Corp ceasing funding to the enterprise, meaning BenQ Mobile had to file for bankruptcy. This was to be the final stroke for BenQ Mobile, who were liquidated in 2007 when no buyers could be found to save the enterprise. There followed an extended hiatus for BenQ in the production of mobile phones, that was until 2013 when it began producing smartphones again under its original name of BenQ. There were a number of corporate re-jigs for BenQ between 2001 and 2007, which saw the umbrella corporation then change its name from BenQ Corporation to Qisda Corporation. The move was intended to remove any ambiguity of the exact structure of the group of companies. Amongst a whole host of other companies sharing the Qisda stable. Gaming is big business these days and BenQ has a presence in the market following its buyout of ZOWIE GEAR, which is now their premier gaming arm. Amongst their products there are high-end sound cards, mice, mouse pads and monitors, which are the ‘go-to’ choice for professional gamers, which says a lot about their standing in the industry. It is said that 8 out of every 10 professional gamers use their products.